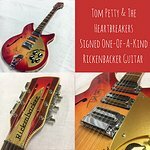 Norman Harris of Norman’s Rare Guitars, located in Tarzana, CA, has partnered with Heritage Auctions to offer rare and iconic Tom Petty guitars and memorabilia from his personal collection. The auction, set to take place in Dallas, TX on July 21, 2018, includes a lot featuring Petty’s personally owned 1965 Gibson SG Cherry Electric Guitar and top hat, expected to garner as much as $300,000 based off of recent auctions of similar notoriety. The collection includes other rare guitars and memorabilia, such as stage-worn clothing, and marks the first offering of Tom Petty guitars since the late singer’s death in October 2017. The early 1965 Gibson SG Electric Guitar, serial number 2775535, features a cherry finish, pearloid inlay on face and headstock, and the signature “Tom Petty ’88.” Petty notably played the instrument with Tom Petty and the Heartbreakers while touring with Bob Dylan’s “True Confessions Tour” in 1987. Petty’s iconic top hat was most often worn during his time touring with The Traveling Wilburys and he is seen wearing it in music videos for “Handle with Care” and “End of the Line,” as well as a 1989 MTV interview with remaining band members following bandmate Roy Orbison’s death. Harris, a longtime personal friend of Petty, originally sold him the 1965 Gibson guitar decades ago. It came back into Harris’s possession as part of a trade when Petty fell in love with a rare, Rose Morris Rickenbacker Double Bound 360 guitar featured in Harris’ first book “Norman’s Rare Guitars: 30 Years of Buying, Selling & Collecting,” for which Petty wrote the introduction. Harris gave Petty the Rickenbacker and Petty returned the signed 1965 Gibson, along with a hand-picked collection of stage-worn clothing. 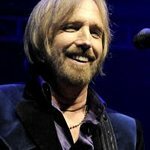 In addition to the trade, Petty also agreed to put on a charity concert with Harris to benefit the Midnight Mission, LA’s premier homeless charity on Skid Row in Downtown LA. Norman’s Rare Guitars has been a music industry institution in the San Fernando Valley for over 30 years. The store offers new, used, and vintage guitars and buys, sells, trades, repairs, and appraises rare and vintage instruments. Proprietor Norman Harris and his staff are experts on vintage guitars and the store offers professional private instruction in acoustic and electric guitar, bass, classical and flamenco guitar, 5-string banjo, mandolin, and dulcimer. For more information, click here.